Despite winning the gold medal at the European championships in Helsinki, Finland, French runner Mahiedine Mekhissi-Benabbad still seemed far from happy. 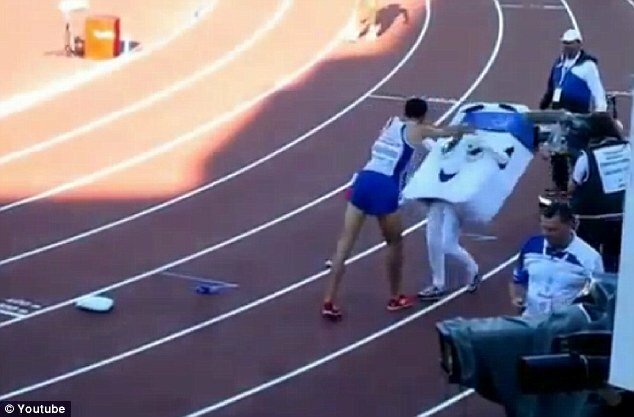 As the 27-year-old steeplechaser crossed the finish line a 14-year-old female dressed as the Championships’ mascot “Appy” stood nearby with a gift bag to congratulate him. But rather than celebrate his 8.33.23-minute victory the 3,000 meter steeplechase, Mahiedine Mekhissi-Benabbad knocked the bag out of the girl’s hand and shoved her backwards. The girl inside the mascot costume was believed to have been slightly winded by the unexpected attack but otherwise unharmed. A member of the public caught the hold exchange on camera on Sunday and posted it on YouTube. It’s not the first time Mahiedine Mekhissi-Benabbad has become a YouTube sensation for all the wrong reasons. Last year he got into a fight with countryman Medhi Baala on the finish line of the 1500 meters at the Monaco Diamond League games that was caught on tape. Mahiedine Mekhissi-Benabbad was suspended for 10 months following that incident.